Turkey for you, turkey for me...2017 Topps GPK Wacky Packages Thanksgiving cards for everyone! The online exclusive combines Garbage Pail Kids and Wacky Packages for a delectable parody set. 2017 Topps GPK Wacky Packages Thanksgiving subjects include iconic brands associated with the holiday, such as Butterball Turkey, Libby's Pumpkin Pie Mix, and McCormick Gravy. 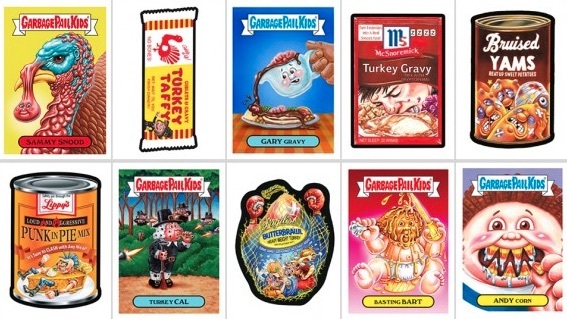 2017 Topps GPK Wacky Packages Thanksgiving is available only as a complete set for $34.99, which contains 10 Garbage Pail Kids (A and B title cards) and five Wacky Packages stickers. Collectors have one week to purchase the 15-card on-demand exclusive via the Topps Online Store. The final print runs will be announced after the sale window closes on November 29. 15 cards; 10 GPK (A and B), 5 Wacky Packages. Shop for GPK Wacky Packages Sets on eBay. Final Print Run is 188 sets. View related Garbage Pail Kids / Wacky Packages sets with our detailed guides.